Today was Day 2 of the Dodger Community Caravan. Yesterday, we spent our time cleaning along the L.A. River. 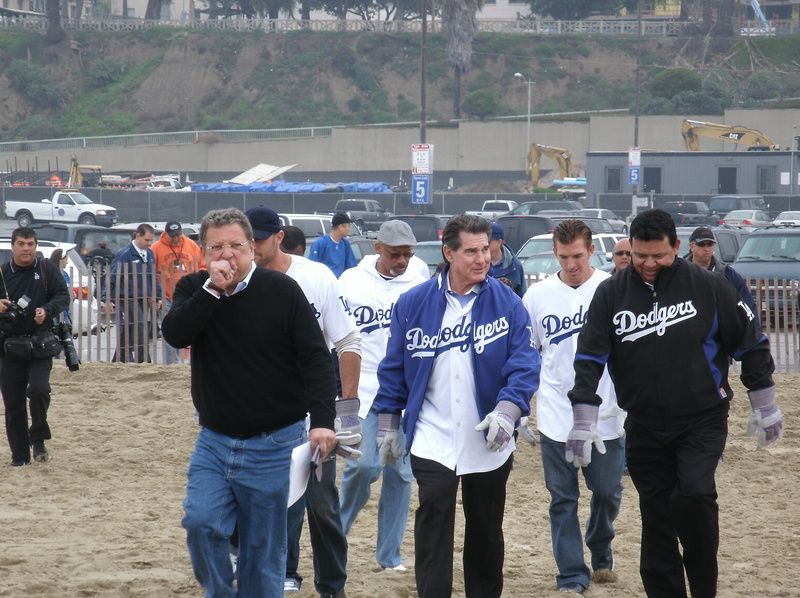 Today, we cleaned up a part of the Santa Monica Beach. We started on the north side of the pier and moved north. It was a little drizzly when we arrived, but stopped by the time the players arrived. We were assigned groups, there were five total. The players arrived and Charley Steiner was the emcee today. Joining Charley were Rafael Furcal, Matt Kemp, Tony Gwynn Jr., Jay Gibbons, Gabe Kapler, Derrell Thomas, Shawn Green, Fernando Valenzuela, Sweet Lou Johnson, and Steve Garvey. 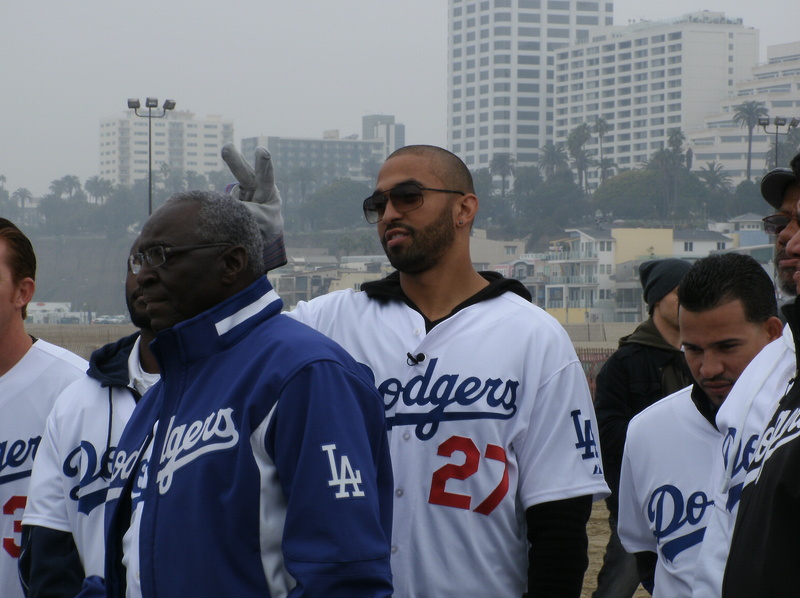 Here’s Matt Kemp fooling with Sweet Lou. Matt, Raffy, and Fernando having a good laugh. 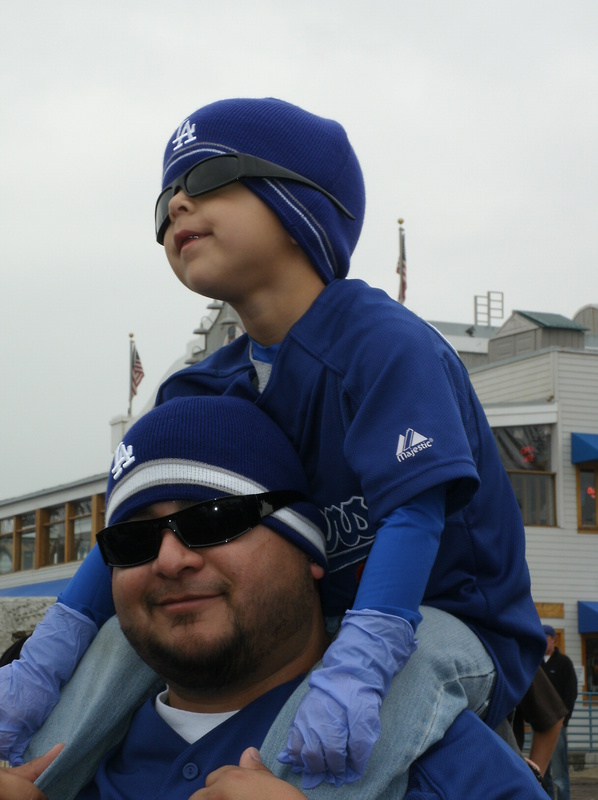 And of course, what’s a Dodger event without Deuce and his “chauffeur” aka dad. Even Tony Gwynn, Jr. recognized Deuce from the Stadium. After the groups were announced, we all headed out to pick up trash. 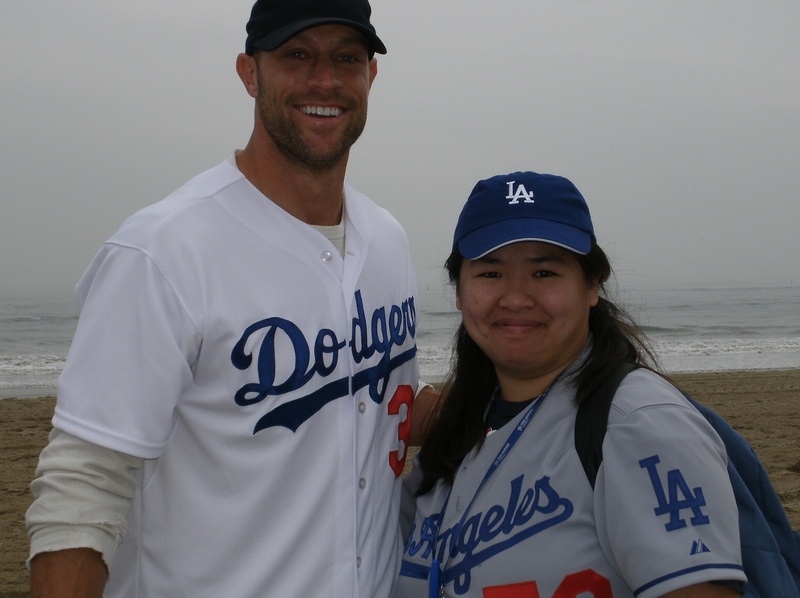 Gabe Kapler and Sweet Lou Johnson were in my group. Like yesterday, it started out as five individual groups and later became one giant Dodger amoeba. Gabe agreed that he would say it that way too. Gabe working hard! The beach was unusually clean today. It was hard to find actual trash. I joked that we were putting just as much sand as trash in our bag. We did manage to find a dime and five cigarette butts, the latter being a very common thing to find. We also found bits and pieces of Styrofoam, to which Gabe commented on how he could easily see how fish could mistake that for food. After a bit, fans started coming up to Gabe asking him for his autograph and/or a picture. Myself included. My friend Cat has a Gabe Kapler story. On Aug 16, 2008, Gabe Kapler made an amazing catch over the short left field wall at Dodger Stadium. Cat and her son were sitting right where Gabe made the catch. I mentioned the story to Gabe and he was like, really? No way! He asked me if I remembered who hit the ball. I wasn’t at the game that night. He remembered. It was Russell Martin. They still have the video up on MLB.com. If not, season ticket holder Dodger Films does. It was almost time to head back, so whatever players were around I managed to get a photo with or signed my scrapbook. For instance, Tony Gwynn, Jr. I already had a photo with Jay. Though I wouldn’t have minded another one. Oh well. I didn’t ask for a photo. Funny story. 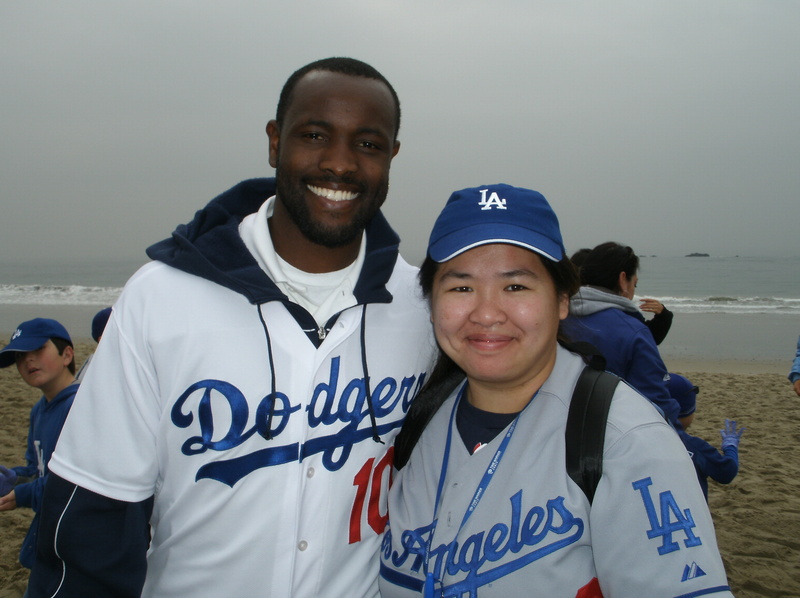 My friend Iriz and I rushed to catch up to Shawn Green, but only one of us was allowed to get our photo take with him. So I took a picture of Iriz an Shawn. Jay wasn’t too far away so I walked over to him. Quite out of breath, I asked him if he could sign my scrapbook. Poor guy. I could barely get the words out. I think he said, “Hey, I know you” and got a surprised look from me in return. Again, I’m not sure if that’s what he said but that’s what it sounded look. 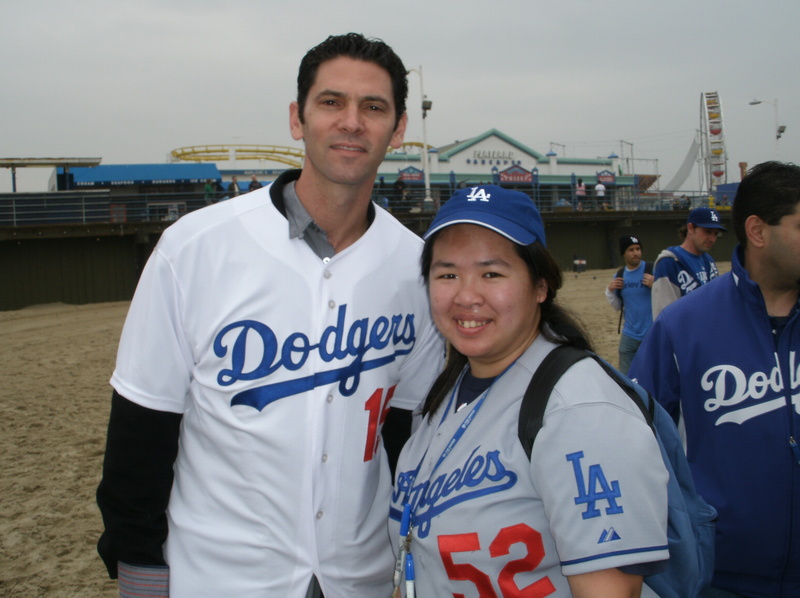 I did get my chance to get a picture with Shawn Green back on the boardwalk. He wasn’t doing anything, just standing there. So I asked if I could get a picture. Four years before I ever went to my first baseball game, I considered becoming a Dodger fan based on the story of Shawn Green not playing a game to support his Jewish heritage. I never got to go to a game and he wasn’t a Dodger anymore so it was four more years before I finally went to my first game. There was just one more person I needed to sign my scrapbook and it was Matt Kemp. Unfortunately, what happened when I tried to ask him became quite an embarrassing moment for me. He saw me and said, “You have a thousand of autographs of mine. I know your face.” It took me by surprise and shocked me. I stammered out that I only had three or four, one for each scrapbook. I was quite embarrassed. Got a good laugh out of it, but still embarrassed. Roberto over at Vin Scully is My Homeboy was there and got it all on video. I understand why he said no and will respect his wishes and won’t ask him for any more autographs. But I would like to correct the misconception that I have “thousands” of Matt Kemp autographs because I have only been collecting autographs since 2007. Specifically, I only have 4 things signed by Matt Kemp, and that’s just as many things that I have signed by AJ Ellis, Jamey Carroll, Jon Garland, John Ely, Carlos Monasterios, and that’s just off the top of my head. And he is definitely the player who I have the most autographs from. Oh well. k a huge group photo of everyone who showed up to participate. Guess who made his way to the front to stand by Gabe and ended up right in front of me. Yup, Matt Kemp. Like the river event, I enjoyed this one (despite the embarrassing moment but oh well, what can I do besides laugh about it?). 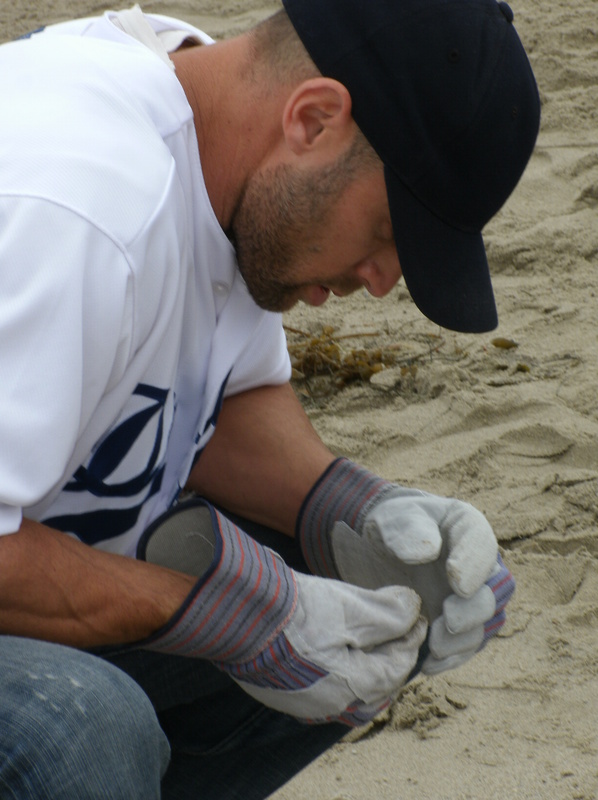 Written by fallingleaves02 Leave a comment Posted in Dailies	Tagged with Dodgers, Gabe Kapler, Shawn Green, Tony Gwynn Jr.